Photo: EU Humanitarian Aid and Civil Protection/Flickr. It’s a good day to write about climate science and climate denial. A typhoon of historically unprecedented strength hit the Philippines last weekend, with reports of 2,000 to 2,500 dead. Homes and lives are devastated, corpses hang from trees and litter the rubble of houses and buildings. At the UN Climate Talks being held in Warsaw this week, the lead negotiator from the Philippines, Naderev Saño, has announced that he will fast for the duration of the conference, “until a meaningful outcome is in sight” – a direct challenge to the negotiators to do more than talk. 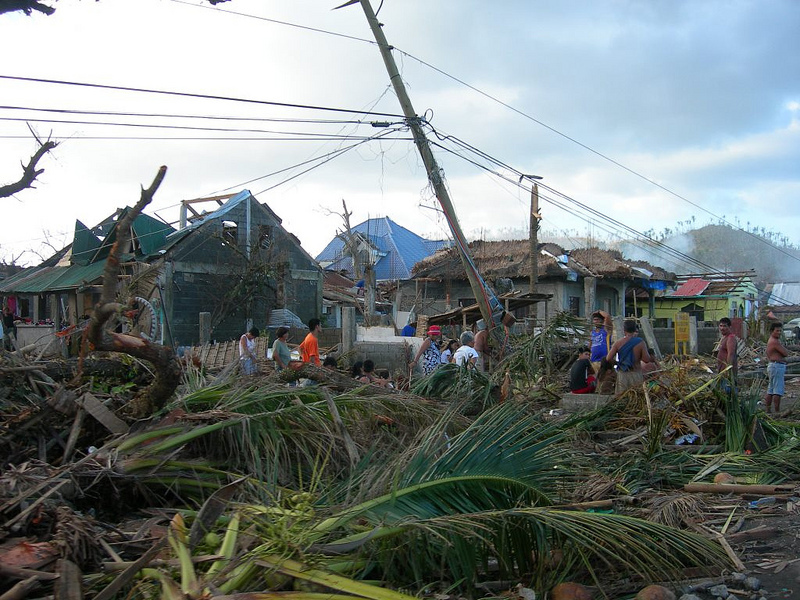 Typhoon Haiyan was caused by climate change. Superstorm Sandy was caused by climate change. If we don’t stop climate change, we can expect these “Hundred Year Storms” to become an annual or semi-annual occurrence. Imagine you are next, because you are. Here’s the science in a nutshell: As I write this the Intergovernmental Panel on Climate Change has just released its fifth report. Comprised of 2000 of the world’s top climatologists, it’s the most thoroughly researched, compiled and peer-reviewed scientific document of all time. The IPCC’s consensus tells us that the Earth is warming at a rate unseen at any time in human history, and that this is due to human activity of burning fossil fuels and releasing unprecedented amounts of carbon dioxide into the atmosphere. We have raised the surface temperature of the Earth by 0.8 degrees Celsius (1.4F), and we have raised the amount of CO2 in the atmosphere from 270 parts per million to 400ppm. While the Earth has warmed before, and in some cases quite rapidly, each such drastic warming was accompanied by a mass extinction event. This human-forced warming is causing storms of unprecedented strength (Sandy). It’s causing drought and therefore wildfires. It’s causing flooding (warm air holds more moisture). The ocean is not only warming but acidifying due to increased CO2, causing shelled creatures to dissolve (at the bottom of the food chain, therefore affecting all level of ocean life). Glaciers are melting at an alarming rate, and those who depend on their fresh water will soon be facing famine. Meanwhile, despite amazing technological process in the technology and feasibility of renewable energy (solar and wind), the amount of fossil fuels burnt continues to rise at a rate of 2-3% each year. It seems we are not facing this. We are in denial. The fight against true climate deniers gets ugly quick. I stay out of it unless I’m directly challenged, and in that case I pull out my debater’s knowledge of types of false logic and try to precisely name what I’m hearing. But the sort of people who turn up in the comments section of every “green article” in the news aren’t going to be dissuaded by logic, and aren’t worth much of an activist’s time. The Appeal to Hypocrisy: Climate deniers love to accuse believers and activists of being part of the problem. “How did you get to that protest?”, they sneer, “did you walk?” Their point is that unless you have cleansed your life of all fossil fuels you are part of the problem, and therefore nor qualified to criticize it. The Argument from Irrelevant Authority: There are a few scientists out there who still deny climate change is human-caused, deny that it is happening, or otherwise trivialize it. I think there are three or maybe even five. Most of them are not climatologists and many of them are in the employ of fossil fuel companies. A simple fact is that 97% of climatologists now agree that climate change is happening, is caused by us, and is powerfully destructive. The Ad Hominem Attack: This will be a character assassination or an attack on your intelligence or common sense, or some other form of personal critique irrelevant to the topic. Just call it out and walk away from the argument. That’s abuse. The denial that concerns me more is present in liberals and centrists, is subtle, is nobody’s fault. Much of it comes from the construct of our minds, and the rest from some very deliberate cultural manipulation. As humans we often believe that we are special: Beloved of God, or privileged by our superior mental and creative capacities. Do we think that our capacity to innovate technology can always outpace our inadvertent destruction of the natural world? Do we believe that nature is self-healing and hugely tolerant of our presence? It’s useful to contemplate these questions without answering them too quickly or reactively. Climate change is happening in real time now. All dress rehearsals are over. Not a week goes by without the occurrence of an unprecedented event. This fall, Colorado was hit by wildfires and floods simultaneously. Arctic ice-cover hit an all-time low last summer (2012) that left scientists saying we will definitely see an ice-free summer Arctic in our lifetimes. Temperature records are broken every day in some part of the world. The monarch butterfly was scarcely seen in New England this past summer at all. Honeybee populations are devastated nationwide, and we face the loss of our main crop pollinator–a fact that alone threatens famine. To not see this is a major failure of attention. It’s not deliberate, but it’s also not accidental. It may be a symptom of the gradual disengagement from the natural world that has been a feature of western life over the last century (in children they’re starting to call this “nature deficit disorder”). It may very well be encouraged and even staged by the corporate world, which wants us for its own purposes. Many goodhearted people fall into something like bargaining with Death. They try to purify their own lives, to “go green” in a variety of ways from changing their light bulbs to buying a Prius to insulating their homes to biking to work to putting up solar panels to going “off grid. There’s a lot of wisdom and good in these actions, but because of their personal and isolated nature, they won’t solve climate change, which is caused largely by a systemic reliance on an unsustainable and ruinous source of energy (fossil fuels). The biggest polluters probably rejoice in our sense of personal guilt. It keeps us busy and off their doorsteps. The math doesn’t work. Voluntary measures to reduce consumption are not going to solve the problem of climate change. They do nothing to persuade industry polluters to change their ways, and this is the key to turning back the death march of increased CO2 in the atmosphere. I am concerned, as well, that we have been encouraged to take too much “personal responsibility” for climate change by those very polluters. It is convenient for them to have us blame ourselves, and spend all our energy atoning for our carbon sins through personal measures. The sense of overwhelm can lead to quite a bit of denial. We may want to react with some anger, saying it’s not my problem. This is just too big for me to cope with. I can’t do anything. It’s up to the scientists/the politicians to deal with this. Actually the scientists are doing their job, which is to gather the evidence, formulate the theories and publish them. The politicians are not doing their job, which is to take the work of the scientists and translate it into relevant policy. That’s where activism comes in; we need to do our jobs. We may convince ourselves it can’t be that bad–if it were we would be hearing more about it. It is that bad. We’re starting to hear more about it. Don’t forget that journalists and editors and publishers are also people who struggle with denial. Add to that the reality that most major news-outlets are corporate-owned now, and often directly or indirectly tied to the fossil-fuel industries. It’s that bad, but there are news outlets you can trust for the truth on climate change. I read the Guardian, National Geographic, Nature, the New York Times (the latter is somewhat variable). Article originally published on JP Green House blog.